Remember the days when big data was the super buzzword and IT invested a ton of money and effort building up Hadoop clusters? Many of them learned the hard way that if you build it, the business may not come. In addition, when you have the infrastructure, you might not have the talent, cleansed data, or practices to demonstrate results. Is the business opportunity big enough? AI requires, talent, infrastructure to process lots of data, and time for experimentation. 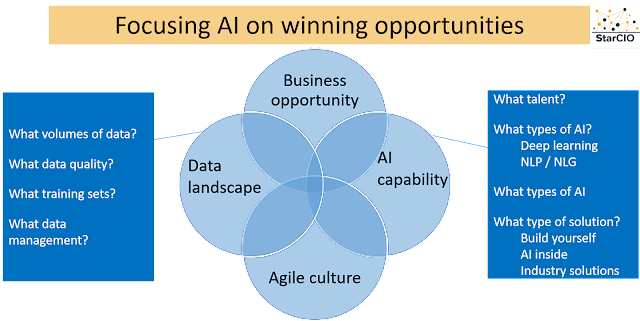 AI business cases that only drive marginal cost savings or low-likelihood growth opportunities are not great options because of the investment, talent, and time required to develop solutions. Aim for larger opportunities even if they are higher risk. What AI capabilities are applicable? - There are many different algorithms and configurations that fall under AI. Ask yourself, are you an expert, or do you have an expert on staff that can select optimal AI algorithms and solutions? Perhaps you don't even need to develop a solution because many tech platforms today are coming with "AI inside." Perhaps using one of these solutions is better/easier than investing in a home grown approach? If your team doesn't have general AI experience, throwing data at an AI without expertise to narrow the playing field can also be a wasted expenditure. Is your organization ready for agile experimentation? AI requires experimentation. Data scientists have to try different algorithms, topologies, and learning parameters to improve performance and results. Organizations looking for a timeline on when an AI will deliver results are asking the wrong question. AI requires agile experimentation. All that being said, organizations in industries that are likely to be disrupted by AI need to get started. Just put some thinking and discipline on where to get started and how to operate. Here are five steps to prepare your organization for AI. If you have questions, then reach out to me!